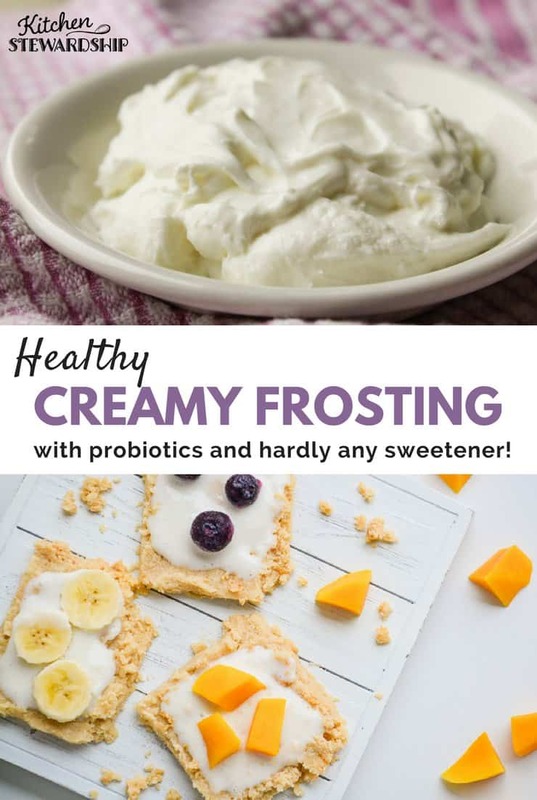 Healthy frosting sounds like an oxymoron, I know, but it can be reality and makes an amazing berry tart or fruit pizza, for starters. 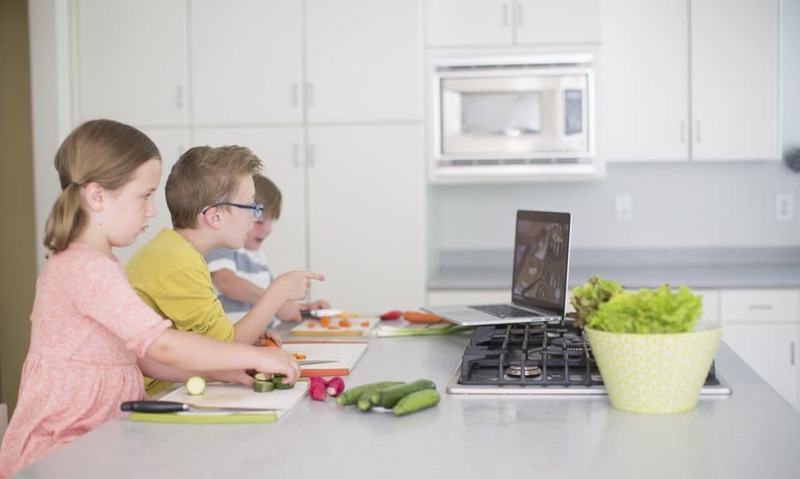 It has no white sugar, and your kids will love to make it themselves! Frosting can really divide a relationship, you know. There’s inch-thick versus paper-thin, there’s so sweet it’s practically straight sugar vs. cream cheese vs. whipped cream fluff with almost no taste. And in my husband’s book, there’s the cake with no frosting at all! Who does that? A whole cake with no frosting? That’s what we used to make him when we were dating, just a vanilla box mix, no frosting. He’s a vanilla kind of guy in every way. For better or for worse (and probably worse now that I know more about sugar), my mom’s homemade frosting actually won him over. We in the family all like to frost our baked goods, so we kind of like that dad likes frosting now. It’s delicious with its almond flavoring, truly the magic ingredient. But. 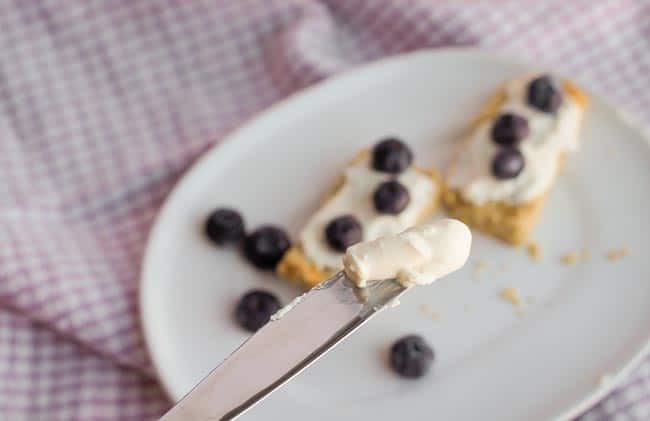 We are a Kitchen Stewardship family, and frosting that is mostly sugar, albeit using plenty of healthy butter, is not something that we should be seeking out. Today’s recipe was my solution to healthy + delicious frosting. It combines thick, probiotic-rich yogurt cheese with minimal sweetener and almond extract… Perfection. 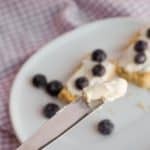 Yogurt cheese is a lot like cream cheese but with only one ingredient and of course probiotics, which are always helpful. For a whole cup of yogurt cheese, we only use one tablespoon of pure maple syrup, tops, which means the sugar and carb count stays very low. In fact, for kids like mine, who are used to eating plain yogurt with zero sweetener, we actually can get away with pretty much no sweetener at all. Think of it – there’s already usually a good bit of sugar in whatever baked good you’re topping. We don’t need to slather pure sweet on top and mask all the good flavors we’ve worked to get in the middle. The best part, in my opinion, is that once you’ve made this recipe once or twice, you won’t even need the recipe again. It’s super easy to just eye it up, guess and check, and taste until you love it. 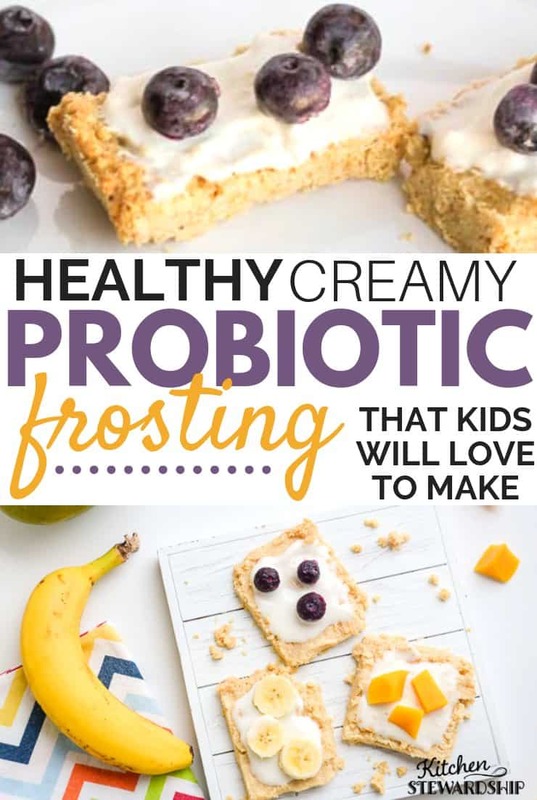 This is a great recipe for the kids to make. Let them experiment with ratios and sweetness. It will foster creativity while teaching them life skills. So what to put almond flavored probiotic yogurt cheese frosting ON? Just about anything will work. It goes great on any cake or cupcake that would work for a birthday cake and is especially great on things with spices like cinnamon, cloves, and nutmeg. 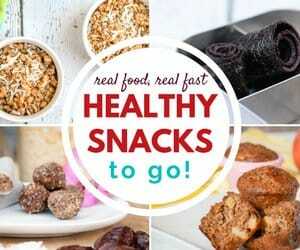 That means any sort of applesauce, carrot, or pumpkin muffin is a good fit. And cookies? Why not! Particularly a butter or sugar cookie that doesn’t have a lot of flavor in itself, really does need a little zip in the frosting. This frosting works great! 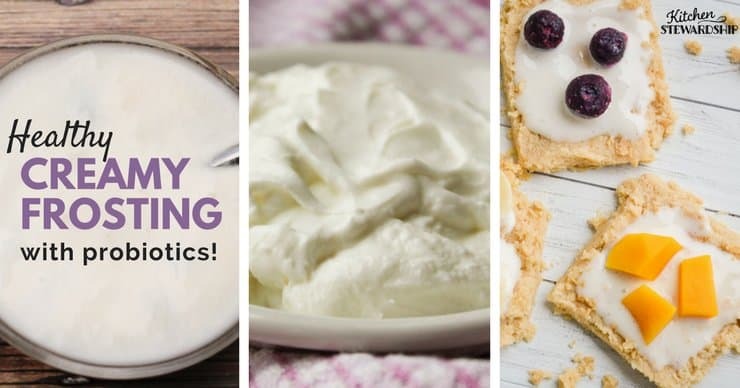 This frosting is already incorporated in some family favorite recipes like our egg-free, grain-free first birthday cake (a frozen pumpkin fudge) and our healthy whole grain fruit pizza. One year for my son’s birthday we used half sugary frosting (Mom’s famous!) 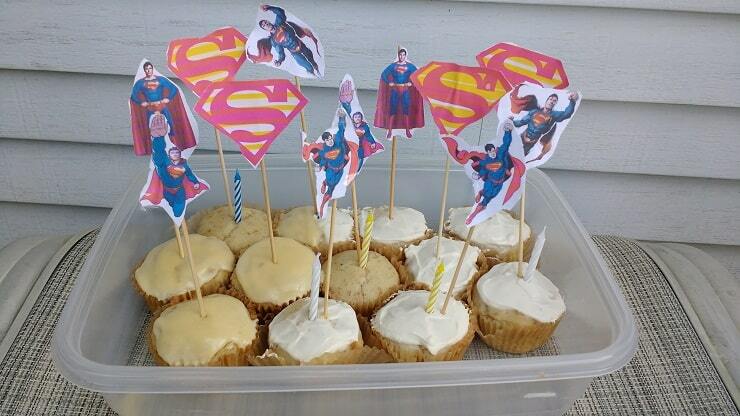 and half probiotic frosting, and NO food coloring, just cute superheroes on sticks! The only bad news ironically is that my husband doesn’t like this one! He’s just not a fan of cream cheese, so even though he really does like plain yogurt, this is tangier than he prefers. Bummer, right? I’m thinking if I took the time to blend it with some thawed frozen berries, however, he’d be all about it. Worth trying for a future post, right? Finally, here’s that recipe that you can pretty much eye up and memorize after you try it once! A solution to healthy + delicious in frosting. It combines thick, probiotic-rich yogurt cheese with minimal sweetener and almond extract… Perfection. Whip up until smooth, and be sure to taste and adjust as necessary! I generally don’t measure anything but just pour a bit of extract into the cap and dump it in, then drizzle a wee bit of maple syrup on top. I really do think that it is sustainable and pretty yummy without any sweetener, and it’s very easy to reduce carbs further by using stevia drops. NuStevia even has flavored stevia that could switch up your taste sensations easily! * Color this frosting pink by adding some juice from thawed, frozen raspberries or strawberries. * Add flavor by stirring in pure fruit jam or pureed fresh or frozen thawed berries of any kind. * Try other natural colors with real food as shown here. Next Post » What’s the REAL Cost of Your Toilet Paper? You should look into making frosting with whipping cream in the food processor. You are in complete control of the type and amount of sugar. As a bonus, you can powder freeze dried fruit to add to it. We have made strawberry, but not ventured to other flavors. Thanks for all the great posts and encouragement. I have made one made yogurt and yogurt cheese. Question, can you freeze yogurt cheese to make icing when you need or even freeze the icing o use another time? 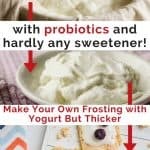 I’ve never tried freezing it, but freezing yogurt really negatively impacts the consistency, so I’d be hesitant to expect great results with yogurt cheese.